Should Arsenal be quietly confident against Man City? It is definitely a truism that Arsenal seem to roll over when faced by the big teams, and you can’t get much bigger than Man City at the moment. They embarrassed us badly more than once last season and they themselves will be feeling very confident as they begin the defence of their title. 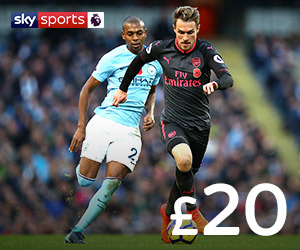 Watch Arsenal v Manchester City and more Premier League football this season with Sky Sports. Click here to upgrade to all Sky Sports channels for £20 per month. But Arsenal have a new manager and and some new players, and hopefully some surprising new tactics to try out on Pep Guardiola’s team, and as discussed in the previous article they will also hopefully have a new fighting spirit as well. The Gunners have been unbeaten in pre-season and have scored a hatfull of goals, and Emery himself believes that there is some optimism around the squad. “My first message [to the players] is clear,” he said. “Think about each match. Enjoy the challenges of each match. “I am looking every day and the players are smiling in training with a big collective spirit. They are working and finishing tired but with a smile also on their face. It is great to know they are enjoyng themselves, but I wonder if it’s enough to get over our inferiority complex against City. The fans are definitely much more confident for the start of the new campaign and perhaps Emery has given the same boost to the players. I certainly damn hope so!!!! This entry was posted in Arsenal News, Arsenal NewsNow, Arsenal previews on August 11, 2018 by Admin. maybe because we won’t need any winges if he goes 4 1 2 2 1 which becomes 343 when we attack. lb) montreal he’ just mr consistent might win the fight yet again this year underrated!! or niles anywhere hope he tries to get in. i think those are are strongest 11 and it would work well for his pressing. In this lineup RB,CB and CM are the main concerns. Bellerin is off form so Licht should start. I’d play Mustafi and Mavropanos if that’s possible. Xhaka is not good enough and I don’t know why anytime we are asked to mention our best lineups he’s always part.I thought the rule was that in every top team when a player doesn’t play well he gets benched?Average last season and did nothing off note in the World Cup or preseason to suggest he’ll be world class which is even a stretch for him. Guendouzi is good but just like any other player he has his weakness.The problem with him is that he’s quite similar to Xhaka and their problems are almost the same.He’s just more mobile and the better dribbler.He needing time on the ball is his problem. We don’t have speedy wingers to give Walker & Mendy sleepness nights. Ozil & Mkhitaryan will be forced to track back a lot. Those who want Licht must have forgotten his pace is a problem. Licht is not as a slow as people make him out to be.In fact he’s faster than Sokratis and Mustafi but most are ok with those starting because the assumption is that they won’t be faced directly 1v1 with the fast City players.Licht is also better defensively than Bellerin and a better crosser. To me it’s a no brainer but I see your point.I’d much rather play him and would have wanted Leno to start had he been well integrated into the team during preseason. kev, I agree; some people on here mustn’t have watched Lichtsteiner’s play for Switzerland, or must think he fluked 7 winners medals in Seria A. He is not slow. I remember when David Seaman, the Arsenal goalkeeper was well into his 30’s and still one of the fastest players in the squad. Playing a defensive approach wouldnt win us the game (we might get damage control tho)…. So i think confidence is really needed and we can hide under the underdog title and cause an upset(like Liverpool did last year) but playing defensively won’t win us the game,it wouldnt even get us a draw…. I agree with.We need to be in their faces not everyone behind like the tactic Crystal Palace used against them last season.That will win us this game since they won’t have it easy in their passing and build up. As long as the whole team put a shift in….. can’t stomach another carabao cup final display COYG!! Ramsey Torriea Xhaka In Midfeld In A 433 formation against mancity. gotanidea exactly the same line up i also expect unai to use. the only thing that gives me confīdence is the fact that i know emery will adapt to the opposition. we have a small chance to win but even if we lose,i don’t think it will be by a large margin of 3 goals like last season. weekday lose 3-0 in the carabao cup final against city then on the same weekend lose by the same margin in the league against the same city. no wonder emery is so confident.he knows no way he can do worse than wenger. wenger really lost the plot last season. Control the middle and get a chance to win. Lost the middle and get annihilated. Pressing needs the correct personnel. Ramsay, Guendouzi, Torerria and Welbeck will all work hard to keep City off balance so their possession will not hurt us as much. If Sokratis can get into Augero’s head then there is a chance… But, Lich and Mustafi cannot make mistakes, not Sokratis. I like the young legs in the middle. The forwards have to win the game, but at least let them focus on attacking, so City cannot dare to push up too far with their back line. Speed is what can kill City. Is Auba and Welbeck fast enough to cause problem down that flank? (That they forget Ramsay getting a through ball from Guendozi? Will the focus on removing Ozil mean openings for others? So there. That is a hopeful post before the game. OMG u saw my mind, AMN substitute for welbeck. Guess who? And, who said this? I’m new to this blog but have had various amusing reads over the years, I’m concerned about the team being outpaced so much that it could do some major damage to confidence so early on. Would make my day though if we could pull off what most think is not possible, up the gunners. Self-belief, commitment, pressing football and a well-organized defense will win us the match if Aubameyang and Lacazete start. 3-1 city will expose our defensive frailties and create numerous chances just a matter of how many they take may sound like doom and gloom but I am realistic and not deluded!! City are not Barcelona of Messi, Iniesta, Xavi, Busquets etc..
We can take them on proper if we can get the loser we attained under Wenger. They should have belief that they can do it. Why buy Torreira if you want to put him to cross the ball? Who is going to press consistently with an unbalance mid-field?